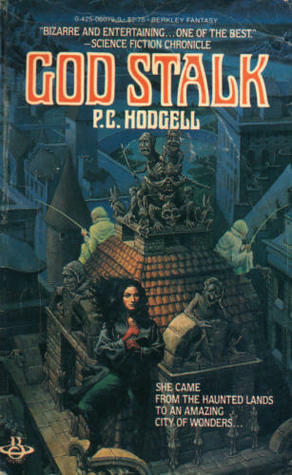 God Stalk is another book I remembered very fondly from my teenagehood (I even had a limited-edition hardcover), and recently re-read to see how it withstood the test of time (as well as comparing older and contemporary young-adult fantasy). I enjoyed it tremendously — and kept reading through the series. Some of those volumes I’ve now read for the first time. Below are my thoughts of the series broken by books, for prospective readers. God Stalk is a highly entertaining story, setting up the beginning of an epic fantasy cycle. Hodgell is slowly building the mythology around the people, characters, and places in the world. Hints and back stories are alluded to, giving tantalising tastes of things to come. Structurally, the story takes place in important episodes over the span of a year and a bit. We get to know Jame, her companions, and the fantastic city and world as events interweave and grow in tempo to conclusion. Allow me to go on a tangent: there is the question of the thieves guild. While this is a fantasy trope (and in Hodgell’s defence, she published this in 1982, before many recent treatments), one always wonders about how cities can support this. There is the basic predator/pray populations ratio that every biologist will tell you about. Conversely, large enough populations to support such a large guild would be expected to develop mechanisms to cohabitate in close proximity. Be that as it may, this is handled well in the novel. Back to the series. The second volume, Dark of the Moon, alternates viewpoints between Jame and Tori. They lead vastly different lives and adventures, and Hodgell uses both to expose us both to the world of Rathilien and to the culture of the Kencyrath. Both characters are highly engaging, and both plots leave you turning page as you (and them) make your way to meeting at the grand battle at the end. Seeker’s Mask was published almost a decade after the previous volume. There’s a slow start to the novel, as Jame is confined to the Women’s World and the accompanying frustration. Once things get going though, we’re back to the usual (read: Jame in the centre of some colossal destructive events, looking slightly apologetic). Hodgell exposes more of the politics and the Riverland ‘home country’ of the Kencyrath, as well as playing with myth forces, both old and new to the world. Overall, it’s an excellent continuation of the series. Blood and Ivory is a collection of short stories. It includes 3 stories (well, two plus a fragment) that expose some background to the story to come (in the next novel and further sequels), one story that’s pretty much a fun little missing chapter from God Stalk, the original short story out which God Stalk grew (that reads pretty much like certain bits towards the end of that book), a short that happens some unknown years in the future, a short about Jame in an alternate, post-apocalyptic world, and an unrelated short about Sherlock Holmes (that is more Gothic horror than detective, even if it does credit to Conan Doyle’s style). In some ways, the three first shorts contain “spoilers” as they illuminate things that Jame will only learn way down the line. In other ways, they make those events a lot clearer to the reader. The best way I can describe this collection, is as the “DVD extras” for the series — non-essential bits, for the die-hard fans. To Ride a Rathorn continues where Seeker’s Mask left off. Jame is thrown into another impossible situation at the military college of Tentir. We get to see this aspect of Kencyrath culture, enjoy her sojourns into the dream-like under-layers of reality, get a bit more of Torisen, and generally marvel at the mayhem Jame spreads. More of the past is revealed, some questions are answered, and events are inexorably — albeit slowly — advance towards to the inevitable end of days. All in all, Hodgell keeps up her excellent writing, with rich language, engaging characters, and a truly magical fantasy world. Bound in Blood sees Jame continuing her military education in the randon college of Tentir, as well as increasing involvement with the Merikit hill-tribes and the native forces on the Kencyrath’s adopted world. Some of the mysteries that were painfully obvious to readers who have been following the books diligently are becoming clearer to the characters, and they in turn are growing up towards their inevitable final role in what would one day be a climatic resolution to this epic cycle. If you’ve read so far in the series you probably like Hodgell’s style, but if you haven’t this isn’t the place to jump in. Honor’s Paradox details Jame’s second half of the year as a randon cadet. Expect more adventures, more native forces and power struggles, and further advancement of the overall story arc. It’s great to see Torisen and Kindrie rising into their own as well. By now both Hodgell and fans have settled into a good pace, and if you’ve read so far than rest assured Hodgell consistently delivers high-quality fantasy that makes the whole series very well worth the read. The Sea of Time takes Jame finally out of the Riverland (after four novels). We get a wonderful look at the world of Rathilien, with its bizarre societies and locations. We also get an important history lesson — both to the Kencyrath and the world, and personally to Jame and Torisen — as the past shadows the present. The novel also contains the first real skirmish with what would be the main conflict and resolution of the entire epic cycle. This last bit I felt a little underdone, but other than that quibble the book is as well written as the rest of the series. The Gates of Tagmeth is the latest novel in the series, but not the last. Jame has a unique task for her third year as a randon cadet, and naturally it comes with her penchant for unique adventures. More importantly, the novel ends at a point that has been long in the coming, with a final stage-setting for the series conclusion. It’s great to see all the characters (main and side) mature and develop. From reading Hodgell’s blog, my understanding is that the next novel — “By Demons Possessed” — is currently with her editors, and that she has started writing the next, and possibly final, volume. Naturally, writing and publishing is a lengthy exercise, but at least as a fan I know the grand finale is in the works and should be coming soon(ish). It’s been an amazing journey (definitely for the protagonists and for me as a reader since childhood — and I can only imagine for Hodgell as an author), well worth the read. Hodgell’s story-telling and world-building are top-notch, the characterisations are without par, her story pacing is excellent, and she balances light and dark themes perfectly, without going overboard in either direction. I love the tantalising glimpses into Jame’s past, and the slowly-building tension around her. One can’t help but feel immersed in the story, love Jame’s vibrancy, and wish to learn more. The first volume — God Stalk — is more or less self-contained, but it’s obvious at the end that it is merely the beginning of a larger cycle. This novel was published in 1982, and I imagine some modern readers might find the style a bit dated. The latest installment (book 8) was published last year — 35 years on. The series is still not complete, though I expect GRRM fans will likely not mind this in the least. The city of Tai-tastigon from God Stalk is wonderful, but the rest of the series takes place in other locations (mostly the Kencyrath home of the Riverland). Style also changes between novels, although I find the writing consistently excellent. Some volumes do seem to have a bit of a slow start, (Seeker’s Mask the most noticeably so), and details of the overall arc are accumulated in snatches towards the final confrontation. A highly recommended series. This is epic fantasy done right, with perfect balance of light and dark, and excellent, slowly-building pacing. This is a series that has withstood the tests of time, and I was glad to reread the original volumes as well as delve into new (for me) books. If you love fantasy, I strongly suggest you add God Stalk to your TBR pile.